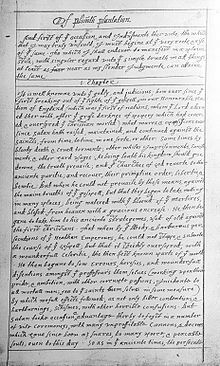 Of Plymouth Plantation is a book written by William Bradford between 1630 and 1651. It tells of the Pilgrims, of their years in Holland, their voyage on the Mayflower, the founding of Plymouth Colony in Massachusetts, and the colony's early years. The book ends with a list written in 1651 of Mayflower passengers and what happened to them. New England Religious History at Gordon College includes Of Plymouth Plantation and other works in a variety of formats. This page was last changed on 31 August 2017, at 09:08.